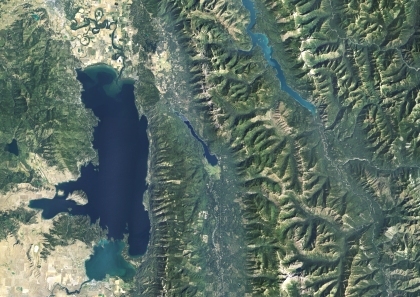 The Montana Spatial Data Infrastructure (MSDI) Imagery Framework layer relies solely on the imagery products produced by the National Agricultural Imagery Program (NAIP). Digital orthoimagery are georeferenced images of the Earth’s surface. Displacement of objects has been removed for sensor distortions and orientation and for terrain relief. This collection of Downloadable Aerial Photographs of Montana includes compressed versions of the natural color NAIP images for 2005, 2009, 2011, 2013, 2015, and 2017 statewide USGS black and white digital orthophotos collected between 1990 and 2003; and several regional air photo collections. 2019 - The state of Montana is scheduled to be flown through the NAIP. This is a web application for viewing the web services listed above. Many geographic features, including those that are part of the Framework, can be interpreted and compiled from an orthoimage. Orthoimages can also serve as a backdrop to reference the results of an application to the landscape.